For my birthday, my close friend Mary Cobb gave me a copy of Richard Bach’s Illusions: The Adventures of a Reluctant Messiah. I’ve made my first, quick pass of the book, and I took a short page of hand-written notes. I put the book and the notes in a stack with Rosamund Stone Zander and Ben Zander’s The Art of Possibility: Transforming Professional and Personal Life, which another close friend – my teaching and learning partner – Jill Gough gave me in January 2011, and which I was re-reading for purposes at work. In Illusions, Bach wrote about a return of the Messiah as a airplane pilot who spends time with another airplane pilot who provides rides to midwesterners for about $3 per 10 minutes. In the section of the book I am currently re-reading as part of the meta-stack on which I am concentrating now, the Messiah is explaining to Richard that life is a series of illusions. Skeptical of such a philosophy, Richard bucks the thinking, and the Messiah takes Richard to a movie – Butch Cassidy and the Sundance Kid. “It’s a good movie, Do. Sh.” Butch and Sundance, blood all over them, were talking about why they ought to go to Australia. “Why is it good?” he said. “Look, I’m here because you asked me to come in here!” I turned back and tried to watch the end. “Nothing at all,” he said, and he didn’t say another word till it was over and we were walking again past the used-tractor lot and out into the dark toward the field and the airplanes. It would be raining, before long. He was laughing at me, I knew it. “You don’t understand,” he said. “Well yes.” I was beginning to understand. “Well, it’s entertainment,” I said. And the exchange goes on, even more brilliantly. Indeed, all of life comes to us in narrative form; it’s a story we tell. Experiments in neuroscience have demonstrated that we reach an understanding of the world in roughly this sequence: first, our senses bring us selective information about what is out there; second, our brain constructs its own simulation of the sensations; and only then, third, do we have our first conscious experience of our milieu. The world comes into our consciousness in the form of a map already drawn, a story already told, a hypothesis, a construction of our own making. It’s all invented anyway, so we might as well invent a story or a framework of meaning that enhances our quality of life and the life of those around us. And, then, as illustration, the Zanders utilized the famous nine-dot puzzle. 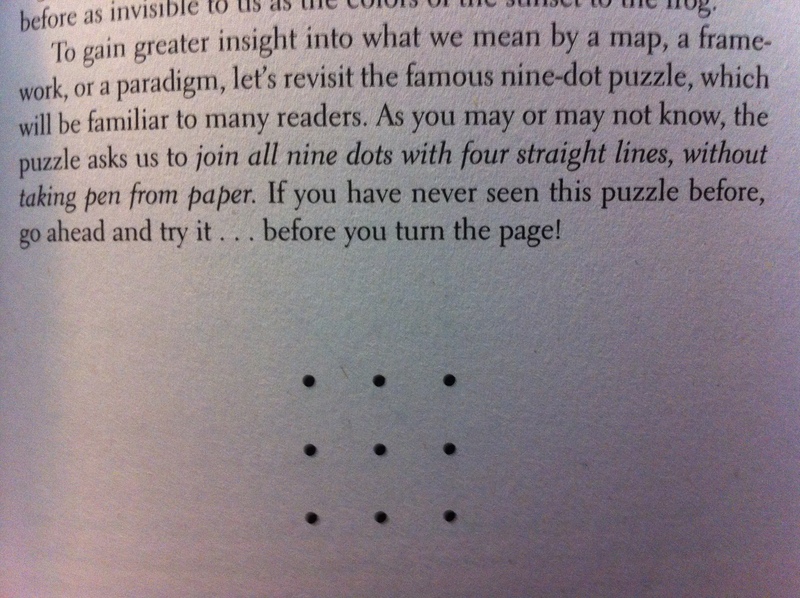 As you may or may not know, the puzzle asks us to join all nine dots with four straight lines, without taking pen from paper. 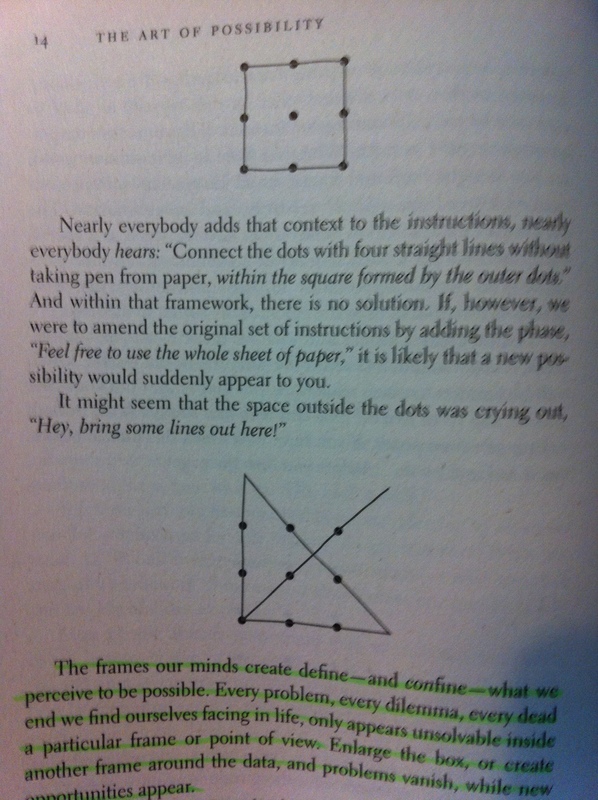 The solution involves untethering our minds from some inferred systems constraints and drawing outside the boundaries. The frames our minds create define – and confine – what we perceive to be possible. Every problem, every dilemma, every dead end we find ourselves facing in life, only appears unsolvable inside a particular frame or point of view. Enlarge the box, or create another frame around the data, and problems vanish, while new opportunities appear…. you can shift the framework to one whose underlying assumptions allow for the conditions you desire. So, if you’ve read this far…God bless you. And what’s my point? When I talk of school and education to many people, I think they unknowingly enter the nine-dot puzzle or ask “Why are we here?” But to me, school and education – the 3.0 versions – can be solved by thinking beyond the unintended boundaries of the dots…by creating a new movie of fun and learning. School 3.0 could involve a family of sorts including business, social innovation, and education. The lines that solve that puzzle may be discovered by re-imagining the boundaries…by creating a new script for the next story. A cloud does not know why it moves in just such a direction and at such a speed. It feels an impulsion…this is the place to go now. But the sky knows the reasons and the patterns behind all clouds, and you will know, too, when you lift yourself high enough to see beyond horizons. Bach, Richard. Illusions: The Adventures of a Reluctant Messiah. [New York]: Delacorte, 1977. Print. Zander, Rosamund Stone, and Benjamin Zander. The Art of Possibility: Transforming Professional and Personal Life. New York, NY: Penguin, 2000. Print. This entry was posted in Education - School 3.0, Unboundary and tagged Benjamin Zander, Illusions, Richard Bach, Rosamund Stone Zander, The Art of Possibility, Unboundary, Unboundary 7.0 by boadams1. Bookmark the permalink. …“The lure of this book’s promise starts with the assumption in its title: The Art of Possibility. Possibility–that big, all-encompassing, wide-open-door concept–is an art? Well, who doesn’t want to be a skilled artist, whether in the director’s chair, the boardroom, on the factory floor, or even just in dealing with life’s everyday situations? Becoming an artist, however, requires practice, and what the authors of The Art of Possibility offer is a set of practices designed to “initiate a new approach to current conditions, based on uncommon assumptions about the nature of the world”. The Zanders’ book is one of my favorites. (I particularly like the chapter on Giving an A.) From your stack reading I am now blessed with a new book. Lovely prospect! I’ve been thinking much about this slumbering blog of mine that I started six years ago. Your post brings me back to it–as a number of things seem to be doing lately. It may need to come out of retirement soon. It’s title: Architecture of Ideas. It’s tagline: Shifting a framework requires drawing outside the lines. Thank you, Bo, for beautifully crafting thoughtful provocations such as this one to move beyond what we “see” and -though dark-bring to light some new images and the chance to craft a new narrative. In fact, Architecture of Ideas has been in my feed reader for at least two years. As part of a weekly routine, I check to see if any badge number pops up there. Reminds me of Good Will Hunting and the regular check on the house to see if Will’s there. I will continue to check the reader, and I do hope to see that you’ve gone to check about an idea. Thanks for your words and encouragement, Laura. It will not come as a surprise that “Illusions” was one of the most influential books of my life. I will tell you just how influential: I read it when I was about 19, and have not gone back and re-read it because I don’t have to. The message was so freeing and resonated so deeply that with me; it was part of me before I read it, I just did not know it, if that makes sense. Thanks for sharing and reminding me/us of the power of what Bach tells in such simple strokes! “The message was so freeing and resonated so deeply that with me; it was part of me before I read it, I just did not know it, if that makes sense.” That makes perfect sense. What a concise and thorough summary of the book’s essence. It is a beautiful story and thought raiser. I can see it as influential in infinite ways. Thanks for sharing, especially during a busy time for you on the road. I came to the same point while reading Kevin’s story pages 61-63 in The Falconer, by Grant Lichtman. For me, the story about Kevin showed how dramatically our story impacts our lives. Kevin had a story about life, about his abilities, about the boundaries of human experiences. Because he held that story to be true, it became real for others to witness. I have found in my own life that when I consciously choose a new story for myself, my whole life changes to match the story that I am telling myself. “What you focus on is what you get”–we have heard that before. But this is actually about drawing your own map and then watching the territory change to correspond to your map. Yes, indeed. Drawing one’s own map and watching the territory change…. Reminds me of the adage that we need for the future more folks who can draw maps, and not just more folks who can simply read maps.